For other uses, see Catiline (disambiguation). Lucius Sergius Catilina, known in English as Catiline (/ˈkætəlaɪn/; 108–62 BC), was a Roman Senator of the 1st century BC best known for the second Catilinarian conspiracy, an attempt to overthrow the Roman Republic and, in particular, the power of the aristocratic Senate. He is also known for several acquittals in court, including one for the charge of adultery with a Vestal Virgin. Catiline was born in 108 BC to one of the oldest patrician families in Rome, gens Sergia. His parents were Lucius Sergius Silus and Belliena. [page needed] Although his family was of consular heritage, they were then declining in both social and financial fortunes. Virgil later gave the family an ancestor, Sergestus, who had come with Aeneas to Italy, presumably because they were notably ancient; but they had not been prominent for centuries. The last Sergius to be consul had been Gnaeus Sergius Fidenas Coxo in 380 BC. His great-grandfather was Marcus Sergius. Later, these factors would dramatically shape Catiline's ambitions and goals as he would desire above all else to restore the political heritage of his family along with its financial power. An able commander, Catiline had a distinguished military career. He served in the Social War with Gnaeus Pompeius Magnus and Cicero, under Gnaeus Pompeius Strabo in 89 BC. During the regime of Gaius Marius, Lucius Cornelius Cinna and Gnaeus Papirius Carbo, Catiline played no major role, but he remained politically secure, married to the niece of Gaius Marius. He later supported Lucius Cornelius Sulla in the civil war of 84–81 BC. According to accusations made by Cicero, during Sulla's proscription Catiline helped Quintus Lutatius Catulus avenge himself upon the prosecutor who had caused the death of his father: Catiline's brother-in-law, Marcus Marius Gratidianus. Catiline maimed and killed his brother-in-law at the tomb of Catulus, then decapitated the corpse. Catiline proceeded to carry the head through the streets of Rome and deposited it at Sulla's feet at the Temple of Apollo. Catiline was also accused of murdering his first wife and son so that he could marry the wealthy and beautiful Aurelia Orestilla, daughter of the consul of 71 BC, Gnaeus Aufidius Orestes. In the early 70s BC he served abroad, possibly with Publius Servilius Vatia in Cilicia. In 73 BC, he was brought to trial for adultery with a Vestal Virgin, a capital crime. Catulus, by then the principal leader of the Optimates, testified in his favor. Catiline was acquitted. He was praetor in 68 BC, and for the following two years was the propraetorian governor for Africa. Upon his return home in 66 BC, he presented himself as a candidate for the consular elections, but a delegation from Africa appealing to the Senate, indicting him for abuses, prevented this as the incumbent consul, Lucius Volcatius Tullus, disallowed the candidacy. He was finally brought to trial in 65 BC, where he received the support of many distinguished men, including many consulars. Even one of the consuls for 65 BC, Lucius Manlius Torquatus, demonstrated his support for Catiline. Cicero also contemplated defending Catiline in court. Eventually, Catiline was acquitted. 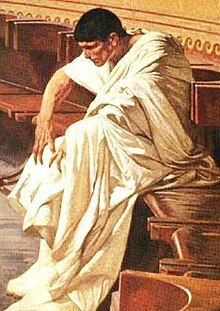 The author of the Commentariolum Petitionis, possibly Cicero's brother, Quintus Cicero, suggests that Catiline was only acquitted by the fact that "he left the court as poor as some of his judges had been before the trial," implying that he bribed his judges. The first Catilinarian conspiracy was a plot to murder the consuls of 65 BC and seize power. Historians consider it unlikely that Catiline would have been involved in the First Catilinarian Conspiracy or, indeed, that the conspiracy existed at all. Catilina propaganda cup for the election to 62 BC consulate (right cup). These cups, filled with food or drinks, were distributed to the electors to support the candidates. During 64 BC, Catiline was officially accepted as a candidate in the consular election for 63 BC. He ran alongside Gaius Antonius Hybrida, whom Sallust suspected may have been a fellow conspirator. Nevertheless, Catiline was defeated by both Cicero and Antonius Hybrida in the consular election, largely because the Roman aristocracy feared Catiline and his economic plan. The Optimates were particularly repulsed because he promoted the plight of the urban plebs along with his economic policy of tabulae novae, the universal cancellation of debts. He was brought to trial later that same year, but this time it was for his role in the Sullan proscriptions. At the insistence of Cato the Younger, who was then quaestor, all men who had profited during the proscriptions were brought to trial. For his involvement, Catiline was accused of killing his former brother-in-law Marcus Marius Gratidianus, carrying this man’s severed head through the streets of Rome and then having Sulla add him to the proscription to make it legal. Other allegations claimed that he murdered several other notable men. Despite this, Catiline was acquitted again, though some surmise that it was through the influence of Caesar, who presided over the court. Catiline chose to stand for the consulship again in the following year. However, by the time of the consular election for 62 BC, Catiline had lost much of the political support he had enjoyed during the previous year's election. He was defeated by two other candidates, Decimus Junius Silanus and Lucius Licinius Murena, ultimately crushing his political ambitions. The only remaining chance of attaining the consulship would be through illegitimate means: conspiracy or revolution. The second Catilinarian conspiracy was a plot, devised by Catiline with the help of a group of aristocrats and disaffected veterans, to overthrow the Roman Republic in 63 BC. Cicero exposed the plot, which forced Catiline to flee from Rome. Alcide Segoni's The Discovery of the Body of Catiline (1871). In the Gallery of Modern Art, Florence. The failure of the conspiracy in Rome was a massive blow to Catiline. Upon hearing of the death of Publius Cornelius Lentulus Sura and the others, many men deserted his army, reducing the size from about 10,000 to a mere 3,000. He and his ill-equipped army began to march towards Gaul and then back towards Rome several times in vain attempts to avoid a battle. However, Catiline was forced to fight when Quintus Caecilius Metellus Celer blocked him from the north with three legions. So, he chose to engage Antonius Hybrida's army near Pistoia, hoping that he could defeat Antonius in the ensuing battle and dishearten the other Republican armies. Catiline also hoped that he might have an easier battle against Antonius who, he assumed, would fight less determinedly, as he had once been allied with Catiline. In fact, Catiline may have still believed that Antonius Hybrida was conspiring with him—which may have been true, as Antonius Hybrida claimed to be ill on the day of the battle. When the battle was ended it became evident what boldness and resolution had pervaded Catiline's army. For almost every man covered with his body, when life was gone, the position which he had taken when alive at the beginning of the conflict. A few, indeed, in the centre, whom the praetorian cohort had scattered, lay a little apart from the rest, but the wounds even of these were in front. But Catiline was found far in advance of his men amid a heap of slain foemen, still breathing slightly, and showing in his face the indomitable spirit which had animated him when alive. Catiline was found, far in advance of his men, among the dead bodies of the enemy; a most glorious death, had he thus fallen for his country. After Catiline's death, many of the poor still regarded him with respect and did not view him as the traitor and villain that Cicero claimed he was. The aristocratic element of Rome, however, certainly viewed him in a much darker light. Sallust wrote an account of the conspiracy that epitomized Catiline as representative of all of the evils festering in the declining Roman Republic. In his account, Sallust attributes countless crimes and atrocities to Catiline, but even he refuses to heap some of the most outrageous claims on him, particularly a ritual that involved drinking blood of a sacrificed child. Later historians such as Florus and Dio Cassius, far removed from the original events, recorded the claims of Sallust and the aforementioned rumors as facts. Up until the modern era Catiline was equated, as Sallust described, to everything depraved and contrary to both the laws of the gods and men. Nevertheless, many Romans still viewed his character with a degree of respect. Well after Catiline's death and the end of the threat of the conspiracy, even Cicero reluctantly admitted that Catiline was an enigmatic man who possessed both the greatest of virtues and the most terrible of vices. He had many things about him which served to allure men to the gratification of their passions; he had also many things which acted as incentives to industry and toil. The vices of lust raged in him; but at the same time he was conspicuous for great energy and military skill. Nor do I believe that there ever existed so strange a prodigy upon the earth, made up in such a manner of the most various, and different and inconsistent studies and desires. Catiline spoke with an eloquence that demanded loyalty from his followers and strengthened the resolve of his friends. Without doubt Catiline possessed a degree of courage that few have, and the way that he died is considered a particularly honorable death in Roman society. Unlike most Roman generals of the late republic, Catiline offered himself to his followers both as a general and as a soldier on the front lines. While history has viewed Catiline through the lenses of his enemies, some modern historians have reassessed Catiline, such as Michael Parenti, in The Assassination of Julius Caesar. To a great extent Catiline's name has been freed from many of its previous associations, and to some the name of Catiline has even undergone a transformation from a traitor and villain to a heroic agrarian reformer. Thus, some consider Catiline to be a reformer such as the Gracchi who met similar resistance from the government. But many place him somewhere in between—a man who used the plight of the poor to suit his personal interests and a politician of the time no more corrupt than any other. In parts of Italy up until the Middle Ages the legend of 'Catellina' continued to exist and was favourable to him. Still other scholarly texts, such as H. E. Gould and J. L. Whiteley's Macmillan edition of Cicero's In Catilinam, dismiss Catiline as a slightly deranged revolutionary, primarily concerned with the cancellation of his own debts accrued in running for so many consulships, and in achieving the status he believed his by birthright due to his family name. At least two major dramatists have written tragedies about Catilina: Ben Jonson, the English Jacobean playwright, wrote Catiline His Conspiracy in 1611; Catiline was the first play by the Norwegian 'father of modern drama' Henrik Ibsen, written in 1850. Antonio Salieri wrote an opera tragicomica in two acts on the subject of the Catiline Conspiracy entitled Catilina to a libretto by Giambattista Casti in 1792. The work was left unperformed until 1994 due to its political implications during the French Revolution. Here serious drama and politics were blended with high and low comedy; the plot centered on a love affair between Catiline and a daughter of Cicero as well as the historic political situation. Steven Saylor has written the novel Catilina's Riddle, where the plot revolves around the intrigue between Catilina and Cicero in 63 BC. Catilina's conspiracy and Cicero's actions as Consul figure prominently in the novel Caesar's Women by Colleen McCullough as a part of her Masters of Rome series. SPQR II: The Catiline Conspiracy, by John Maddox Roberts, discusses Catiline's conspiracy. Robert Harris' book Imperium, based on Cicero's letters, covers the developing career of Cicero with many references to his increasing interactions with Catiline. The sequel, Lustrum (issued in the United States as Conspirata), deals with the five years surrounding the Catiline Conspiracy. The Roman Traitor or the Days of Cicero, Cato and Catiline: A True Tale of the Republic by Henry William Herbert originally published in 1853 in two volumes. A Pillar of Iron by Taylor Caldwell, published in 1965, tells of the life of Cicero, especially in relation to Catilina and his conspiracy against Rome. A Slave Of Catiline is a book by Paul Anderson that tells of a slave who helps and then hinders Catilina's conspiracy to overthrow Rome. ^ Winningham, Brandon (March 19, 2007) . Catiline. iUniverse, Inc. ISBN 978-0-595-42416-0. ^ Lalli, Virginia (March 24, 2016) . The Verdict of History: The Great Trials. from Ancient Times to Our Days. AuthorHouse. ISBN 978-1-5049-8677-9. ^ Holland, Tom (2003). Rubicon: The Last Years of the Roman Republic p.195. ^ The evidence is only sketchy that Catiline early in his life was married to a sister of Gratidianus, and some scholars, notably B.A. Marshall, have doubted Catiline's role in the killing. For further discussion, see Marcus Marius Gratidianus. ^ Sallust, Catiline's War, Book LXI, pt. 4 (translated by J. C. Rolfe). ^ Cicero, Marcus Tullius (1951). Gould, H.E. ; Whiteley, J.L., eds. Cicero : first and second speeches against Catiline. London: Macmillan. "Catiline" . Encyclopædia Britannica. 5 (11th ed.). 1911.